…this is the most common quote or idea that speaks beyond words. We only understand and value health when we lose it, isn’t it? Hence, prioritizing health over anything else is a need of the hour. It is very difficult to have a healthy diet as every thing that we consume these days are adulterated and so it the air that we inhale. It is thus essential to maintain a healthy diet. 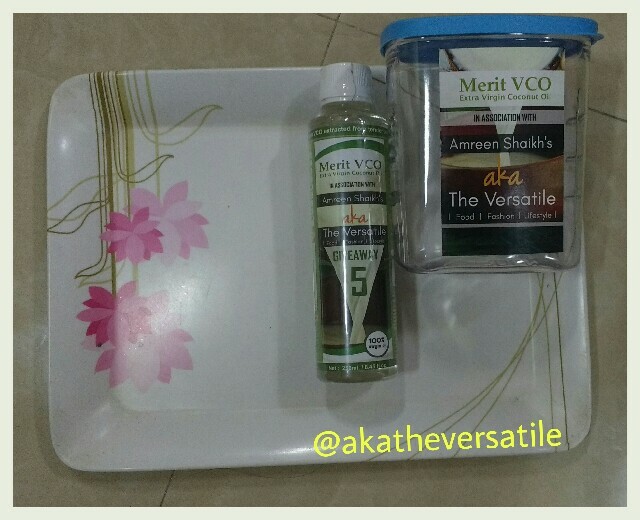 A few days ago, I bought a bottle of Extra Virgin Coconut Oil from the brand Merit VCO. The packaging was so neat and clean. The oil is extracted from tender coconut milk made with natural ingredients. It is completely chemical free and unrefined. It contains lauric acid which is naturally found in mother’s milk. I believe it is one of the best oils that I have used so far. The texture of the oil is smooth and pure and has a pleasant mild fragrance. It is very light. What are the benefits of Coconut Oil apart from cooking? I decided to not follow the norm when it comes to making any recipe with coconut oil. Thus, you need not expect chips or fries in this post. Instead, I have a sweet delicacy your way. 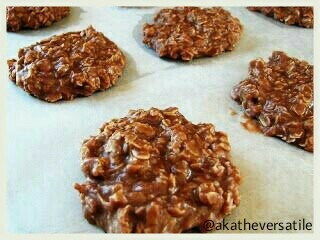 It is No bake coconut oil cookies and they are infused with chocolate and peanut butter. The taste is yum and lip-smacking. I was apprehensive of the results, but later, I couldn’t resist the outcome. They are simply delicious. My entire family and to be honest, the neighbors too loved it and many have asked for the recipe as well. 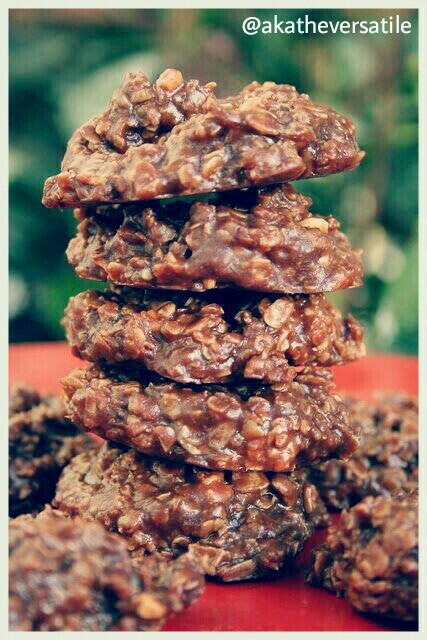 They are no bake cookies and can be made in mere 15 minutes. It is a fresh dessert that one can gift their friends or serve to their guests. To top that, it is vegetarian and gluten-free. So without further ado, let’s dive into the recipe details. Let’s see how I made No bake coconut oil cookies with Merit VCO Coconut oil. 1. In a large skillet, put the sugar, coconut oil, cocoa powder, peanut butter, cashew milk and salt as per the measure. 2. Heat it on a medium flame and keep stirring continuously until the texture becomes smooth. 3. Once the mixture starts boiling, set the timer for 4 minutes and keep stirring and make sure to scrape the bottom and edges. 4. After 4 minutes, remove it from the heat and add in the vanilla and stir. 5. Next, pour in the oats and stir quickly to combine and coat them well. 6. Once done, scoop them on wax paper in proportion. These cookies are a great combination of taste and texture. It has a melt-in-the-mouth quality, simple and satisfying. I prefer to continue making it in coconut oil, as it gives it the desired texture and flexibility. Since I loved this dessert as much as I loved the oil, I am planning to host a giveaway, where each winner will be given a box of No bake coconut oil cookies to taste and relish + a 250 ml bottle of Merit VCO Coconut Oil. Amazing? Yes, we have not 1 or 2, but 5 winners for the giveaway contest, yay? Stay tuned for more updates and action on my Instagram account. I have the rules and details mentioned there as the contest is running on my Instagram account. So how did you like the dessert? Do you use coconut oil in your diet? Share your ideas, thoughts, and opinions in the comment section. Using coconut Oil is a very healthy alternative to using other oils ! I really liked this one ! I do love the flavor of coconut oil in my recipes.. Your cookies look so delicious. Enjoyed reading! I love using coconut oil too. These look delicious and are healthy. It is an amazing recipe. Will try this soon! Possibilities with coconut oil have no limits. We have been using this since many months now and can definitely notice the difference.